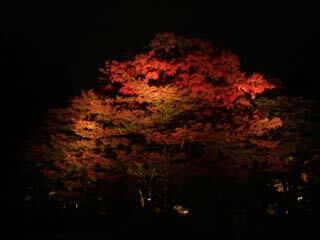 Rikugien (六義園) has lighten up Koyo at the end of November when its leaves are having beautiful Autumn leaves. The Lighten up Koyo is the beautiful collaboration of traditional Japanese garden and modern arts. Every year, they have different sets of the art of light. Light-up: from middle of November to the beginning of December. Time: from sunset to 21:00. During this light-up, the northern gate opens. During the this light-up, tea houses opens at night. You can enjoy green tea under light-up Koyo.